Rank flag of a General of the Air Force. The General of the Air Force (abbreviated as GAF) is a five-star general officer rank and is the highest possible rank in the United States Air Force. General of the Air Force ranks immediately above a general and is equivalent to General of the Army in the United States Army and Fleet Admiral in the United States Navy. The rank has been held only once in history, by General Henry H. Arnold, who served as head of the United States Army Air Forces during World War II. 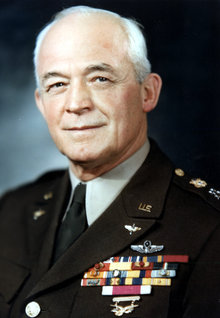 The term "General of the Air Force" was first informally used in 1944 after General Henry H. Arnold was promoted, along with other senior World War II American officers, to the rank of General of the Army. Arnold was at that time head of the United States Army Air Forces which had, for all intents and purposes, become its own branch of service in all but name. To differentiate Arnold from the other five-star generals in the regular U.S. Army (such as Dwight Eisenhower and Douglas MacArthur), Arnold was commonly referred to as "General of the Air Force Arnold" in all but official correspondence in which his rank was listed as "General of the Army (USAAF)". On September 18, 1947, the United States Air Force was founded as a separate branch of service. For the first few months of its existence, U.S. Air Force ranks were identical to the Army, and Air Force service members continued to wear the olive drab U.S. Army Air Force uniforms. In early 1948, the Air Force slightly changed some of the rank titles to include codifying Air Force warrant officer positions as well as specifying that the five-star general rank within the Air Force would be known thereafter as "General of the Air Force". On 7 May 1949, under Public Law 58 of the 81st Congress, Henry Arnold's official U.S. Air Force rank was changed from General of the Army to General of the Air Force. In 1949 the first Air Force blue uniforms were introduced, although regulations allowed former Army Air Force personnel to continue wearing brown uniforms complete with Army badges and insignia (full adoption of the new Air Force uniform would not occur until 1952). Although a "General of the Air Force" insignia was created for the blue jacket, General Arnold was at the time living in retirement in California, and in somewhat poor health, and as such the five-star Air Force rank was never actually worn on active duty by Arnold. Public Law 333 of the 79th Congress had previously changed the five-star rank to a permanent grade, and established that officers placed on the retirement list while in that grade would receive full pay and allowances (under Public Law 282 first establishing this grade, retirement had been at 75 per centum), meaning that Arnold did receive full pay as a General of the Air Force for the rest of his life. It is clear that a grateful nation, recognizing the tremendous contributions of the key military and naval leaders in World War II, created these supreme grades as an attempt to accord to these leaders the prestige, the clear-cut leadership, and the emolument of office befitting their service to their country in war. It is the conviction of the Department of the Air Force that this recognition was and is appropriate. Moreover, appointments to this grade during periods other than war would carry the unavoidable connotation of downgrading of those officers so honored in World War II. Over the next thirty years, various other petitions were made to the Air Force, including granting five-star rank to such senior generals as the Chief of Staff of the United States Air Force, the commander of the North American Aerospace Defense Command (NORAD), as well as to any Air Force officer selected as Chairman of the Joint Chiefs of Staff. None of these petitions were accepted and the Air Force promoted no other officers to the rank of General of the Air Force, although continued to state that the rank was officially listed in the Air Force promotion hierarchy. In 1981, the last surviving five-star officer (General of the Army Omar Bradley) died, thus leaving no living officer of five-star rank. The General of the Air Force rank was listed in a number of Air Force publications as "inactive" or "reserved for wartime", although the rank still remained on most insignia charts. In 1993, General Merrill McPeak introduced an extremely unpopular uniform design which changed Air Force officer insignia to a stripe-based system reminiscent of the United States Navy and often derogatorily referred to as an airline-pilot uniform. During the single year in which this uniform was official, a five-star insignia was designed which appeared on a limited number of insignia charts. The insignia included both a sleeve-strip design as well as dress shoulder boards for the General of the Air Force rank. This insignia, along with the entire uniform design itself, was discontinued in 1994. At that time, General of the Air Force insignia was depicted on insignia charts as simply five stars, without an eagle crest above the stars as had been the previous design. A shoulder-board design for the Air Force dress shirt and sweater was also published. In the modern age, General of the Air Force insignia is depicted as five stars on the Air Force blue uniform jacket. The official policy of the Air Force remains that General of the Air Force is an active rank which could be bestowed in time of war, particularity if a U.S. Air Force officer is given command over allied troops in which one or more five-star equivalent ranks of a foreign military is under operational U.S. control. The Air Force's rank of General of the Air Force is equivalent to the U.S. Army's rank of General of the Army and the U.S. Navy's rank of Fleet Admiral. In foreign militaries, the United States' rank of General of the Air Force has been equated to the rank Marshal of the air force. The only United States Armed Forces rank senior to General of the Air Force is General of the Armies; Admiral of the Navy is also technically senior, but an official comparison between General of the Air Force and Admiral of the Navy has never been made by the United States military. The General of the Armies rank has been held only twice in United States history, both times by United States Army officers (John J. Pershing and George Washington, respectively) and then only once on active duty (Pershing). No Air Force officer has ever been promoted to a six-star position, although Congress retains the right to do so. When Omar Bradley died in 1981, Congress sent a letter to the United States Army Institute of Heraldry requesting to know the feasibility of promoting Bradley to the rank of six-star general, as well as requesting clarification as to the procedure should a United States Navy or Air Force officer ever be promoted to six-star rank. The response to Congress stated: "Should an officer of the Air Force or Navy be promoted to six star rank, that officer should be entitled to the six star insignia with a service specific crest"
The Institute of Heraldry designed a sketch depicting the six-star rank utilized in the three major armed force branches; color images were later produced including a design for a six-star Air Force general rank. This insignia has never been declared official by the United States Air Force, but the insignia design has been retained by the awards and decorations branch of Randolph Air Force Base. There is no established equivalent five-star rank in the other four uniformed services (Marine Corps, Coast Guard, PHSCC, and NOAA Corps). ^ E. Kelly Taylor (2009). America's Army and the Language of Grunts: Understanding the Army Lingo Legacy. AuthorHouse. p. 283. ISBN 978-1-4389-6249-8. ^ Congressional Record 1981, Cong. 97 Sess. 1 – Parts 6-8, "Comparison and Promotion Procedures for General of the Armies and General of the Army of the United States". ^ Congressional Record 1981, Cong. 97 Sess. 1 – Part 8, "Promotion of other service branches to General of the Armies of the United States". Wikimedia Commons has media related to Generals of the United States Air Force.